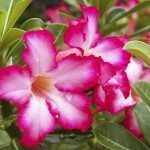 My desert rose is about 3 yrs. old from when I first purchased it. It had 2 seed pods that have recently burst open. Can I start new plants from the seedlings?